During warm weather, the amount of Algae in stagnant water can significantly increase which can not only smell, but also be a risk to health. 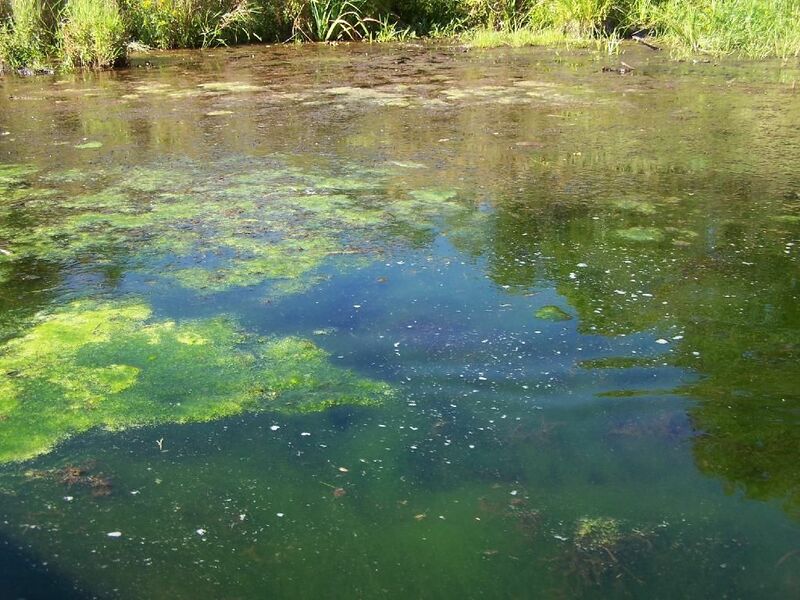 Algae grows rapidly in stagnant water when exposed to daylight and warmer weather. Algal blooms are the result of too many nutrients, particularly phosphorus and nitrogen, available in the water for the plants to grow and thrive. High concentrations of these nutrients directly cause increased growth of algae and green plants. Their microscopic spores are spread easilly by the wind and rain. Algae is a problem as it suppresses other aquatic life using up oxygen. Sudden algal die-offs can cause oxygen depletion. Older lakes and ponds are more susceptible to algal problems as more nutrients will have accumulated as a result off run-off from the surrounding land that drains into the water basin. Blue-green algae (cyanobacteria) are toxic and pose a more serious threat on human health, aquatic ecosystems and the economy. If you notice smelly, green scummy water then keep away from it and keep pets away also.